After becoming only the second South African to win a cycling world title since Burry Stander, Alan Hatherly became a household name in September. 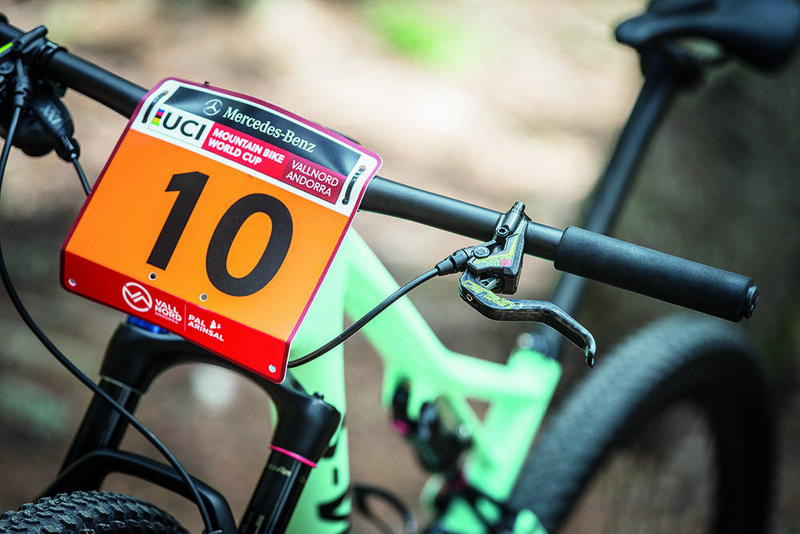 After becoming only the second South African to win a cycling world title since Burry Stander in 2009, Cape Town’s Alan Hatherly became a household name in September when he won the Under-23 Rainbow Stripes in Lenzerheide, Switzerland. Racing BMX since the age of five and DH as a junior, Hatherly now has top-class technical support and dedicated mechanic JP Jacobs to keep everything in running order. A medium Epic S-Works frame fitted with Specialized’s redesigned Brain shock with position-sensitive valving. The S-Works Epic platform has proved to be one of the most winning on the race circuit. It’s the culmination of a continuous R&D process resulting in an approximate build weight of 9kg. Other than using Ceramic Speed pivot bearings, Hatherly’s frame is no different to what you can buy at your LBS – right down to the paint scheme. According to his mechanic, JP Jacobs, track tests of Ceramic Speed’s butter-smooth pivot bearings make a noticeable difference to efficiency and power transfer. Specialized’s Roval Control Carbon SL, hand-built with Roval/DT Swiss hubs and Ceramic Speed bearings. The externally wide rims have a hookless rim bead and a 25mm internal width. 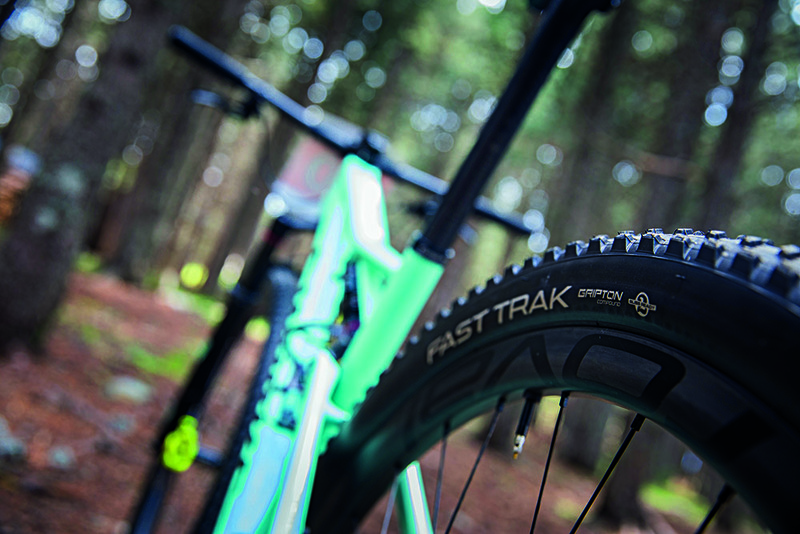 These roll with a pair of 2.1-inch Fast Trak Gripton tyres, though tyre changes may be dictated by a change in race course or conditions. Sealant is consistently checked and topped up as tyres and wheels are inspected. Standard Eagle XX1, SRAM’s flagship 1×12 groupset. On race day the chain is swapped out for a Ceramic Speed version with Teflon-based powder coating, white in appearance, for lower friction. On normal riding or training days, a standard SRAM chain with Squirt lube is used. For Hatherly’s world championship race, JP set the limit screws to keep shifting restricted to the 10- to 42-tooth sprocket, while running a 36-tooth chainring up front. By saving the jump from the 42- to the 50-tooth, JP could run the chain shorter and tighter than normal. Combined with a small chain guide, for the rough and rooted sections, this mitigated the risk of chain drop. Standard spec but distinctive lumo Magura MT8 Raceline calipers run with 160mm rotors front and rear. Along with the carbon brake lever, these are some of the lightest performance brakes that can be bought stock. A full set-up of Specialized’s in-house S-Works accessories. Hatherly’s relatively long reach and taller upper body suit a Fact Carbon seat post with a 10-degree offset and a 120mm long stem slammed at negative-17 degrees. This keeps Hatherley over the front wheel as much as possible for hard corners and on steeper climbs. 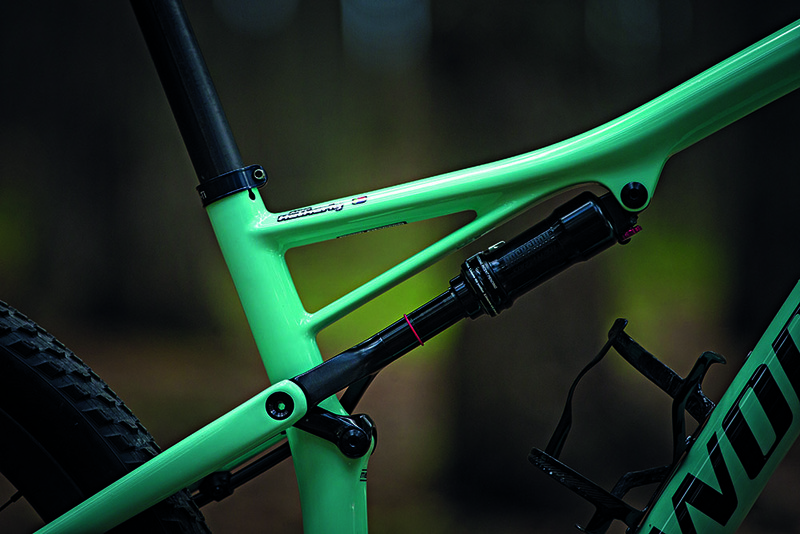 Handlebars are S-Works Mini Rise at 700mm wide – a width that is suited to Hatherly’s shoulder measurements and fit, and not a set-up trend. Grips are Supacaz medium-density lock-on. 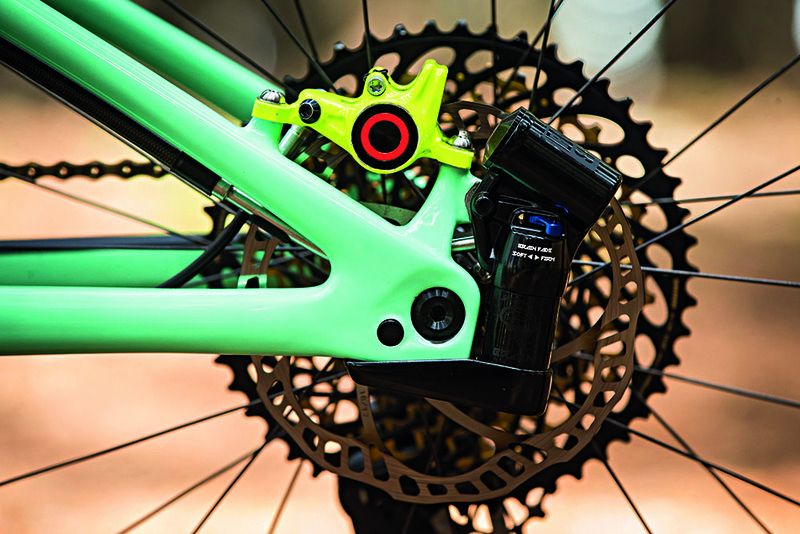 The most significant extra is the use of Ceramic Speed bearings throughout the bike – including the headset. It’s not quite marginal gains, but JP reckons that the cumulative effect produces a significant friction advantage, which saves on power loss and maximises efficiency. 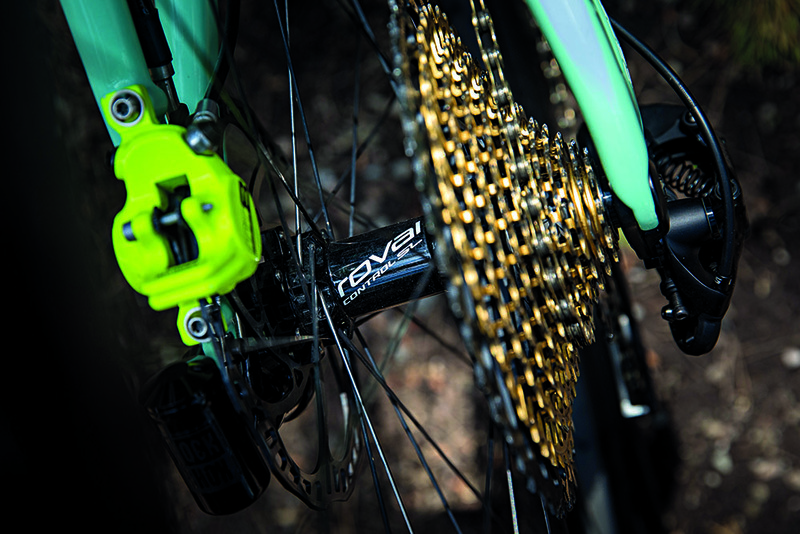 Along with a 36-tooth Rotor chainring are 175mm Rotor Cranks with no power meters. The fork is a carbon SID Brain.